Heat forward LeBron James led all scorers Monday night with 38. 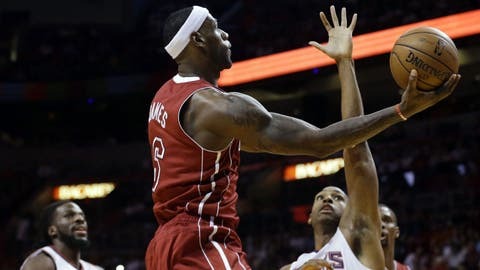 MIAMI (AP) — LeBron James scored 38 points, Michael Beasley made two free throws with 9.2 seconds left to put Miami up for good, and the Heat beat the Atlanta Hawks 121-119 in overtime on Monday night. The Heat wasted an early 13-0 lead, then rallied from seven points down in the final 90 seconds of the fourth quarter. Ray Allen made three free throws with 8 seconds left in regulation to send it to overtime, after getting fouled by Atlanta’s DeMarre Carroll. Christina De Nicola breaks down how the Heat were able to rally back and hold off the Hawks. The Hawks had a chance to win it at the end of overtime, but never got a good look. Chalmers used Miami’s foul-to-give with 2.3 seconds left, sending Atlanta back to the huddle and using its last time-out to draw a play. Bosh, who was in the locker room getting stitches in his upper lip at the start of overtime, guarded the ball. The Hawks’ Pero Antic tried getting a lob to Korver, but Andersen snuffed out the play at the rim, got fouled and added a free throw with 0.3 seconds left. Andersen then knocked away Atlanta’s last-ditch pass as time expired, and the Heat finished off a perfect homestand. Beasley had missed seven games with a strained hamstring, but checked in during the third quarter when Miami was facing a double-digit deficit. On the play where he was fouled by Millsap, he attacked the lane from the left side, drew contact and coolly made the free throws to put the Heat on top. Korver’s long 3 with about 1:40 left put Atlanta up 107-100, but the Hawks couldn’t put it away in regulation. James made a pair of 3-pointers, along with a dunk, and Allen got hit by Carroll on the play that Miami needed to force overtime. Allen’s free throws: Swish, swish, swish. It was all part of a game that had simply wild ebbs and flows. Atlanta got back into it quickly, answering with a 16-5 run to get within two. But the Heat closed with another flurry, and James’ no-look, cross-court pass set up Norris Cole’s 3-pointer with 0.8 seconds left to put Miami up 33-23 after the period. NOTES: Korver’s NBA-record streak of consecutive games with a 3-pointer is now at 97. … The Heat ran a tribute to Nelson Mandela on the arena screens at halftime, narrated by Alonzo Mourning, who spoke of his time meeting the former South African president who died earlier this month. … It was Miami’s last home game of 2013. Including playoffs, the Heat went 47-7 at AmericanAirlines Arena this year, winning the NBA title on their home court for the second straight season. … James has scored in double figures in 522 consecutive regular-season games, four shy of matching Moses Malone for the NBA’s fourth-longest such streak.